This is the perfect place to leave the frenzy of the world outside and get into an oasis of peace,even if for only one hour and a half. The bishop of Pisa Moricotti authorized the construction of the charterhouse in 1366 in a quiet place far from the city suitable for meditation and prayer. Several times restaured and expanded the present charterhouse reflects the willings of the prior Maggi in the 18 century. It is beautiful to walk with your tourist guide of Pisa’s charterhouse into this amazing building discovering, with the help of your guide, all the symbolic messages of the several decorations. You’ll visit the main chapels admiring frescoes, paintings, “trompe l’oeils”, the church, the refectory, the guest house, the pharmacy, the great cloister and even the cell of a monk. The guided tour of Pisa’s Charterhouse continue with the ancient Romanesque church of the XI century with its beautiful baptismal font of the XIII century. 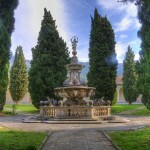 We’ll be glad to take care of your booking for the Pisa Charterhouse .We normally join this tour to the sightseeing in Vicopisano followed by an oil tasting.